ThePen, Refillable Flux Pen for Soldering on PCB's and Rework. By START International. 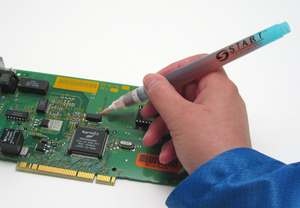 ThePen by START International is a refillable pen for controlled application of liquid solutions. It can be filled with many different kinds of liquids (fluxes, alcohol, protective coatings, lubricating oil, inks, etc.). The fine tip of ThePen allows for application in very small areas and is small enough to fit into a shirt pocket or repair kit. The transparent cartridge shows the liquid level at a glance. Lightly squeeze the ergonomic barrel of ThePen to control the amount of material being dispensed.